Whether parked on the flight line or carving graceful lines across the skies overhead, this brightly colored Curtis P6-E Hawk ARF biplane from Great Planes is beautiful from all angles. 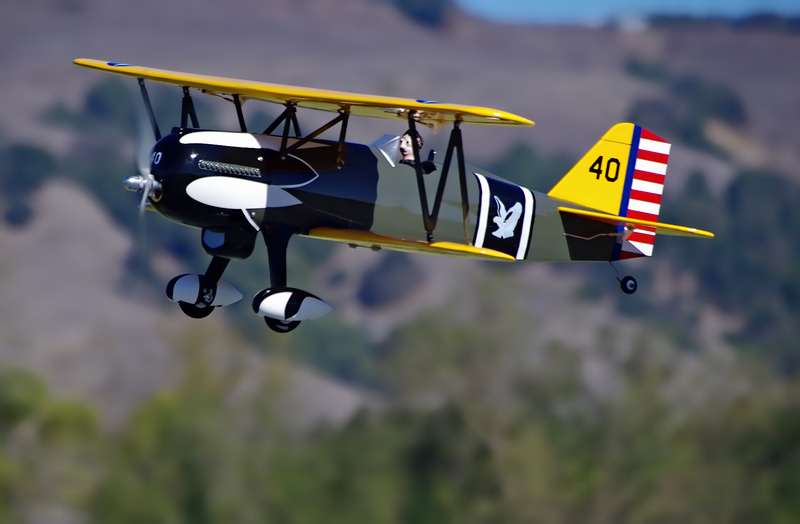 Stick with the recommended RimFire 32 brushless outrunner, 3S 2200mAh LiPo and 13×6.5 prop and you will end up with a parkflyer sized biplane that excels at scale flight. The factory paint job and covering scheme is intricate, attractive, and factory applied, which helps to create a bona fide replica of the only surviving full scale Curtis P-6E Hawk in existence. The earliest days of aviation were dominated by fabric covered airplanes, most equipped with a minimum of two wings. As the years and technology advanced, aircraft designs began to make a shift toward lightweight, metal composition monoplanes. Caught squarely in this transitional period was one of the best looking and best performing biplanes of all times; the Curtis P-6E Hawk. 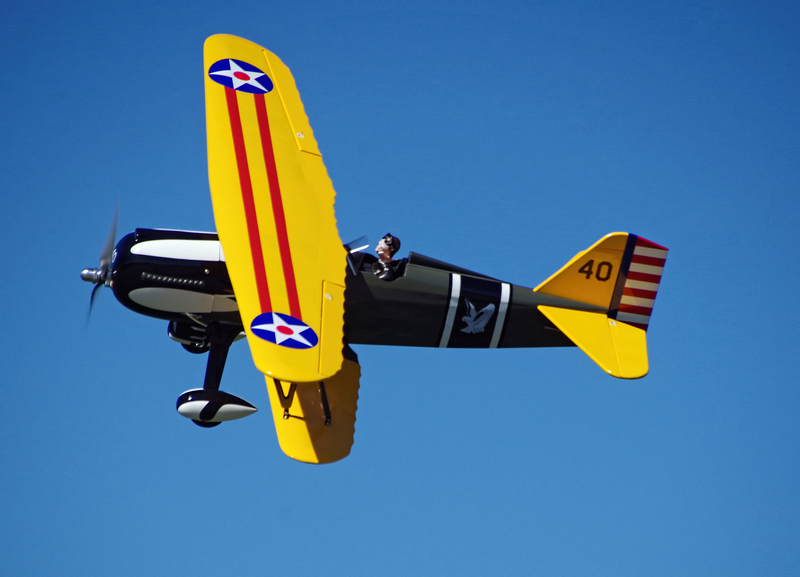 Introduced in the 1930s as a fighter/pursuit airplane, this biplane was notably fast and maneuverable! One of the prototypes even won the 1927 U.S. National Air Races. In 1932, a modified P-6E flew a record setting flight from Dayton, Ohio to Washington D.C. at an average speed of 266 MPH and an altitude of 25,000 feet. 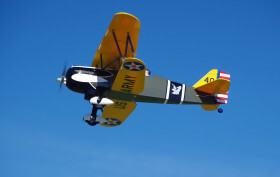 Unfortunately, the transition to metal monoplanes resulted in this superlative aircraft being the last biplane ordered by the US Army Air Corp. and those that were delivered under contract saw limited duty and were only issued to two U.S. based pursuit squadrons. The sole surviving Curtis Hawk, cloaked in the brightly colored Snow Owl motif used by the 17th Pursuit Squadron, can be seen at the Air Force Museum in Dayton, Ohio. It is there on permanent loan from the Smithsonian’s Air and Space Museum. Great Planes has made it possible for pilots who fancy vintage aircraft from the 30’s to get their hands on their own model of the Curtiss Hawk, in the form of their newly released, electric powered Curtis P-6E Hawk ARF. This ARF comes pre-covered in the same striking Snow Owl color scheme, using six different colors of MonoKote to properly create the squadron’s colors. This traditional wood and balsa composition model is designed to accept a RimFire .32 brushless outrunner and to use a 3S 2200mAh LiPo battery. Though this version is substantially smaller than the previous .60 sized release, many of the same scale details and niceties are incorporated into the kit! NEEDED TO COMPLETE: This ARF requires a minimum four-channel radio system, four micro servos, brushless power system, propeller, LiPo battery, spinner nut and pilot figure. Great Planes truly sets the benchmark when it comes to writing comprehensive and easy to follow assembly manuals. I normally make marginal notes in the assembly manual as I work my way through the assembly of a model, in order to document the deficiencies and inaccuracies that I encounter. At completion, my P-6E assembly manual contained nothing more than a smudge and smear from some stray CA! Stick closely to the provided instructions and you will end up with a perfectly assembled airplane. Pre-bent wing strut and cabane mounts make getting the two wings installed and aligned to the fuselage an easy proposition. The included fiberglass cowl and wheel pants are especially nice. These components feature a high gloss paint job that perfectly matches the covering. The engine on the full scale P-6E Hawk is uniquely positioned so that the driveshaft and propeller are located very low on the cowl and the kit clones this scale detail nicely. The cutout in the cowl for the motor is large enough to allow the bell of the Rimfire 32 to cozy up into the opening. It is worth noting that an aluminum spinner nut is NOT included with either the Rimfire motor or the P6-E Hawk kit. Unsatisfied with the appearance of the plain hex nut, I ordered the more scale appearing aluminum spinner nut from Tower Hobbies and had it mounted to the nose of my Hawk two days later. One minor detail that I was not really satisfied with was the manner in which the aileron servo leads were designed to be routed from the top wing down into the fuselage. The assembly instructions suggest that they just be attached to the inside of the cabanes using heat shrink or tape. Getting them inside the fuselage requires cutting a notch or channel into the lip of the fuselage hatch opening. Arranging the aileron servo leads so that they would not inhibit the proper seating of the removable hatch took a little time. Though the end result of this approach certainly works, the notably attractive appearance of this model in my opinion justifies a more elegant or cleverly designed wiring routing solution. I opted to install the included clear windshield and used RC56 type adhesive to do so. A few strips of masking tape were used to hold it in position while the glue dried. This glue also does a great job of securing the narrow plastic turtle deck in place. Unfortunately, the turtle deck “interrupts” the black Snow Owl graphics that wrap completely around the rear part of the fuselage; i.e. the turtle deck is colored solid green to match the fuselage. A little time spent carefully applying black and white paint to the turtle deck where it sits atop the fuselage can easily remedy this small aesthetic anomaly. Though a pilot figure is not included in the box, the semi-scale appearance of this kit all but demands that one be sourced and installed. WING LOADING: 23.3 oz./sq. ft.
Getting a fresh LiPo loaded into the P6-E in preparation for flight is the first and most difficult task to be undertaken. The limited space between the top wing and fuselage coupled with the cabanes that straddle the removable hatch combine to make working under the hood of the Hawk an unexpected test in manual dexterity and patience. With every battery swap, the process did get a little easier and with a fresh pack cinched securely in place, a pilot can focus on the many enjoyable aspects of this beautiful looking biplane. The normal rules for taxiing and taking off a tail dragger apply to the P-6E. Keep the tail planted while taxiing by holding a little up elevator and be proactive with corrective rudder inputs to keep the nose on the centerline of the runway. Though a pilot may choose to resort to just mashing the gas pedal to the floorboard and sending the P-6E aloft with haste like any other sport model, it fairly begs to be flown in a scale fashion! Once we had the model trimmed out, we were able to perform some very realistic looking scale takeoffs. Rolling into the throttle slowly resulted in our best takeoffs. Going easy on the throttle also allowed us to neutralize the elevator prior to takeoff. The rudder becomes effective very early in the takeoff roll, which makes for easy tracking during the departure. 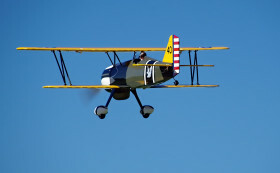 Once the biplane has accelerated to rotation speed, a soft application of up elevator would cause the Hawk to break free from the runway and assume a scale looking and gradual climb out. This style of takeoff seldom required anything more than two thirds throttle. Once in the air, the Hawk continued to show a willingness to be flown as a scale airplane. With only the bottom wing equipped with ailerons, rolls are on the slow side, but ever so graceful. Feathering in a little rudder and elevator as the model rolls helps to keep them nice and axial. This Hawk is well behaved when inverted and can be flown around the pattern multiple times in this orientation without any surprises. With the RimFire 32 at 100% power, the Hawk shows off its pursuit and interceptor heritage. With around 325 watts available (static) when the throttle is on full, the RimFire based brushless power system gives this Hawk just under 100 watts per pound worth of performance. 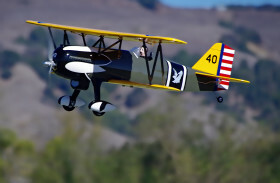 Sport modelers may crave more speed, but scale modelers will, without a doubt, enjoy the way that this biplane performs scale looking aerobatics. Loops will require prudent power management skills, but they look fantastic when executed cleanly. Though this model has a higher wing loading than many foam composition airplanes, we found it very willing to make its way around the landing pattern at surprisingly slow speeds. Sliding down final with about 25% throttle allows the Hawk to come in across the numbers with just the right amount of velocity for landing on the mains. The tail wheel will stay off of the ground until the latter part of the landing rollout. We were quite impressed with just how easy it was to bring the Hawk home, with very nice, scale-looking landings being the perfect ending to our notably scale looking flights. > Six different colors of MonoKote are used to beautifully recreate the Snow Owl markings of the 17th Pursuit Squadron. > This electric powered model is fast and maneuverable, just like the real airplane. > Key scale details include scalloped trailing edges on the ailerons and richly painted fiberglass wheel pants and cowl. > Pre-bent mounting brackets simplify cabane and wing strut installation and alignment. The Great Planes Curtiss P-6E Hawk is one of the best looking, conventional balsa and light ply construction ARFs that I have seen in recent years! With a 43.5-inch wingspan, it is easily transported and fits fully assembled in the back of my mid-size wagon. The recommended RimFire .32 based power system is just right for this ARF; it endows this model with an appropriate performance envelope that is believably scale at both ends of the speed spectrum. From low and slow cruising to fast and frenzied aerobatics, the Great Planes P-6E Hawk offers up an exciting and enjoyable flight experience. 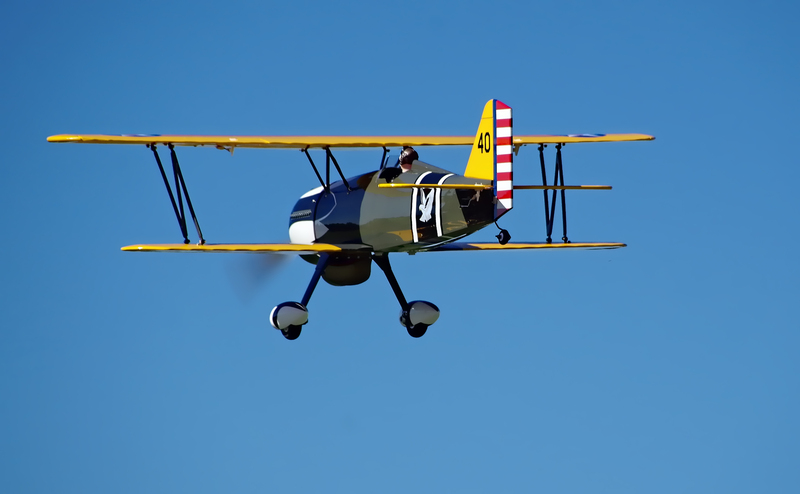 True to the original airplane that it is based on, it is one of the most elegant and attractive looking biplanes ever to grace the skies overhead! In the meantime, this park flyer sized version offers much of the same magnificence in a conveniently sized, clean burning electric powered package.